North American attendees at the Domotex Hannover tradeshow January 16-19, 2010 will have the opportunity to get a first-hand look at some of Europe’s largest DIY retailers such as OBI, Hornbach, and Toom during specially organized “field trips” to stores located near the fair. These giant retailers play a significant role in the floor covering distribution channel throughout much of Europe. To take advantage of this unique opportunity you must be a member of the Domotex North American VIP Delegation. What’s a VIP delegation you ask? It’s basically a fancy name for a FREE package of perks available to any attendees coming from North America. It came about when Jim Gould became an advisor to Domotex. After attending for 20 years he knew he could improve the experience for North American visitors. In its second year, the delegation is a proven hit - and why wouldn't it be? - all you have to do is email us at info@floorcoveringinstitute.com - let us know you are going to Domotex and we'll make sure you are eligible for the perks at no charge. Why not make it easy on yourself? 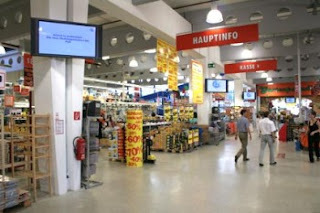 Visits to DIY stores in the Hannover area on specially organized trips. After 20 years of attending Domotex, Jim first visited DIY stores on a fact finding mission with a manufacturer who had hired the Floor Covering Institute to study the European ceramic channel. He found the tour so helpful he wanted to share the experience with others. "In just a couple of hours I was able to see several European giants, some of which give Home Depot and Lowes a run for their money. The experience was eye opening. I could not believe that it had taken me so many years to take advantage of the my travels to Hannover to witness first-hand the German retail floor covering market...I thought this tour was so worthwhile that I asked Domotex to organize a similar opportunity for attendees of our North American VIP delegation." You can read more about the Domotex Hannover fair, retail tours and the VIP delegation at the Domotex blog site where Jim posts regularly. These posts, Join DOMOTEX VIP North American Delegation & Make The Most of Your Visit, and German DIY Tour Available to north American VIP Delegation will answer most of your questions about the delegation and the tours. Europe's floor covering channel differs from the U.S. in several respects. Perhaps one of clearest differences is that ceramic tile is considered a building product and only about 12% of ceramic tile is sold through specialty stores. Roughly 77% of all ceramic sales flow through the wholesale (50%) and DIY(27%) channels. DIY stores play an important part in Europe's floor covering markets and if numbers mean anything, consider that there are more than 4,200 DIY centers in Germany alone. Here are three stores that could be on the Hannover tour. 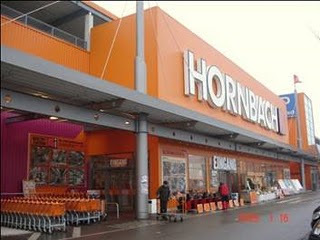 Hornbach operates 129 large DIY centers across Europe, 92 of which are in Germany. It posted a 5.1% increase in sales reaching € 2.75 billion in 2008/2009 in Europe with €1.507 billion coming from their German local market. The company is partially owned by Kingfisher, Europe’s largest DIY retailer. Hornbach caters to the professional and project customers. Average store size is more than 11, square meters. 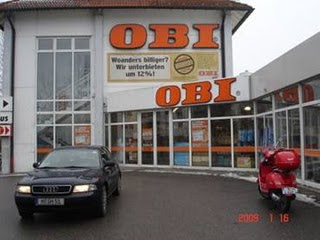 OBI is Germany’s number one DIY retailer operating more than 330 stores in Germany. OBI caters to DIY and semi-professional consumers in stores that are generally larger than 10,000 square meters. OBI's operates an additional 190 stores in Central and Eastern European countries. Total sales in FY 2007/2008 were € 5.8 billion. Toom is the third largest German DIY retail group with 325 stores that recorded € 1.8 billion in sales in 2008. Its concept combines classic DIY offerings with services and consulting expertise of trade contractors and interior designers. Sales areas on average are 6,000 square meters. The same type of tour will be available at the Domotex asia CHINFLOORshow March 23-25, 2010. The Chinese floor covering retail market is entirely different from Europe's - and North America's for that matter - but more about that another time. If you want to know more about either the Domotex Asia show or Domotex Hannover just send us an email at info@floorcoveringinstitute.com.